Members grill secretary of agriculture on top-of-mind issues for rural America, including cotton assistance, WTO challenges and water rule. Addressing the House Agriculture Committee, Secretary of Agriculture Tom Vilsack said the state of the agricultural economy remains sound despite lower commodity prices, but members of Congress pressed in on the hardships, especially for cotton growers in their districts. Secretary of agriculture Tom Vilsack testified before the House Agriculture Committee Feb. 24 on the state of the rural economy. Vilsack explained that commodity price shifts are a result of a slowing global economy, especially in China, which has reduced demand for U.S. product, as well as a stronger U.S. dollar. A record 2015 harvest added to the downturn, which has brought about lower farm income and revenue in farm country. However, Vilsack said the debt-to-equity ratio remains stable, and although more lending is expected, a safety net is in place and working the way it was intended. “While Secretary Vilsack reported that the farm economy is sound, many of the farmers and ranchers that we talk to are telling us the opposite. Nowhere is that concern being felt more acutely than in the Cotton Belt,” House Agriculture Committee chairman Michael Conaway (R., Texas) said. Conaway opened the hearing noting that over the three-year period from 2013 to 2016, net farm income is expected to drop a whopping 56%. Conaway said there were at least five things within the Administration’s power that would make a big difference for America’s farmers and ranchers. The first is to oppose further cuts to the farm safety net provided by the farm bill and crop insurance. Vilsack again defended the President’s budget proposal, which calls for changes to the prevented planting provisions and the price harvest loss coverage premium levels footed by taxpayers. Vilsack responded that he and the U.S. Trade Representative's Office are acutely aware of ongoing issues with India and China and have expressed those concerns to their top officials. He said USTR has already started bringing cases against these countries in a number of areas, which “indicates a willingness to take these folks on.” However, Vilsack also cautioned that there is a limitation on how many cases USTR can take on from a staffing perspective. Conaway also called on Vilsack to persuade Senate Democrats to support a federal pre-emption of state and local biotech labeling regimes, adding that he knows Vilsack is "very committed to this.” The Senate Agriculture Committee was set to mark up a bill on genetically modified organism (GMO) food labeling introduced by committee chairman Pat Roberts (R., Kan.) on Feb. 25, but it was later delayed until the next week. One of the most interesting exchanges during the hearing came when Rep. Ted Yoho (R, Fla.) accused the secretary of not championing biotechnology. 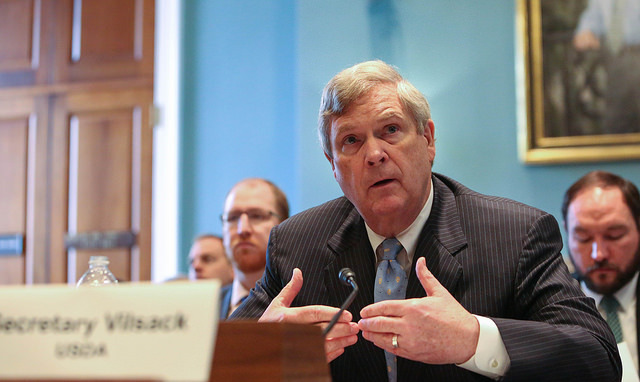 “No one has more been more of an advocate of genetic engineering than me,” Vilsack said, explaining that, in recent months, he spent seven hours in meetings trying to broker a compromise on GMO labeling. As governor, he also was co-chair of the biotech partnership. One of the common threads of questioning from southern representatives at the House hearing was in regard to their desire for USDA to designate cottonseed as an oilseed, which Conaway said was the fifth way for the Administration to provide immediate help. Members disagreed with Vilsack’s interpretation that USDA does not have the authority to designate cottonseed as an oilseed unless the farm bill is reopened. Vilsack did say he could offer assistance in the interim ahead of the next farm bill if Congress removes restrictions placed within the appropriations process on the Commodity Credit Corp. Another option to provide short-term relief is creating a cost-share program within the ginning industry. Vilsack said he also has to be aware of potential trade implications as Brazil has already successfully won a WTO challenge against U.S. cotton programs. Vilsack said Brazil is “very skeptical of anything we do in this space,” and because Brazil won a case that could have exposed the U.S. to $800-900 million in retaliatory tariffs, it is his job to be concerned about potential trade implications that could come by changing support for the cotton industry.